Plymouth Argaum warmed up for next week's crucial league encounter with Buckfastleigh with this comprehensive victory over the Saltash second string. This was probably the best scoreline acheived by a senior Argaum side since an 80-odd point win against a depleted YMCA side in the late 1990s. 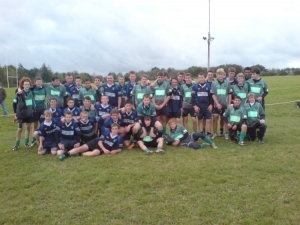 In a classic game of two halves, Argaum survived a spirited second half comeback to win by two points. 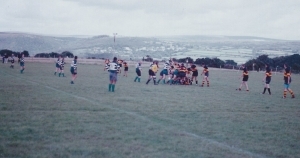 The game was dictated by the Chapel Field slope and blustery wind which made it difficult for however was playing up the slope. These two local rivals served up a thrilling contest to warm up the spectators on a bitterly cold but sunny morning at Bickleigh Down. The home side, with some confidence after winning their last outing at Lankelly-Fowey started brightly up the hill and opened the scoring when prop Liam Quick powered his way over from a tap penalty. Saltash played with a lot of width in their game and used their speedy backs to great effect to allow Doug Shirley to go over for the equalising try. 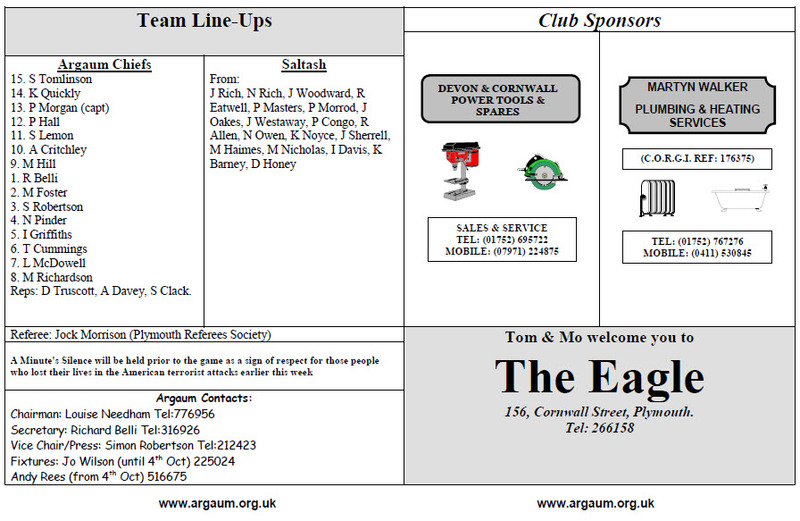 Argaum's defence held up firm to further Saltash attacks and on the stroke of half time captain Carl Turner put his side back in the lead after good forward continuity and Alex Coutts converted to make the interval score 12-5 to the hosts. The colts recorded their 2nd victory of the season in a match where they never really fired on all cylinders. Matches against the cross-tamar rivals have always been pretty tight affairs and there wasn't much to choose between the sides although Argaum always had the upper hand. 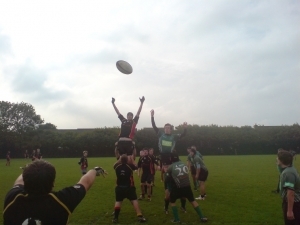 Saltash U16 0 Leicester Forest 14. All 3 teams in this 3-way triangular match were very evenly matched and produced 3 hard fought matches with tight scorelines. With National League Official Trevor Hunter in Charge Argaum kicked off against Saltash in the cross-Tamar derby. 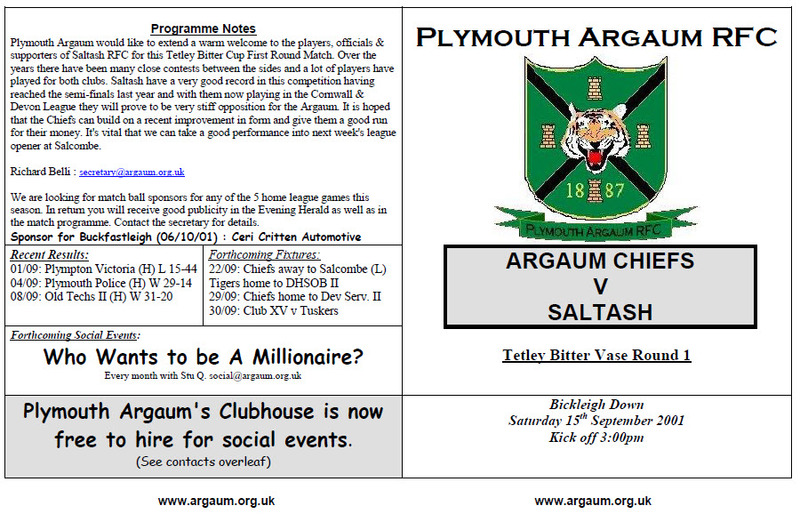 In buoyant mood after good victories over Plymstock and Newton Abbot last week, Plymouth Argaum travelled to Saltash for what turned out to be an exciting encounter. The home team opened the score with a try and conversion after only five minutes, although Argaum responded immediately with an inspired try by their capatin, Sam Russell. The Under 11s produced probably their best performance of the season and opened the scoring with an opportunist try from Jared Williams. Playing up the hill the Argaum backs took the game to their opponents and some strong running saw a further try from Guy Webber whilst second rows Liam Quick and Lewis Furniss grabbed a pair of tries each, with Webber knocking over 2 conversions. The scoring was reduced in the second half thanks to some magnificent defence from the visitors who battled bravely throughout the match and were unlucky not to have crossed the line themselves. However Guy Webber crossed for 2 further tries for the home side whilst Jez Cramoysan slotted 2 conversions to complete the scoring. The trophy cabinet at Moorlands Lane will today be filled with spoils from the RNEC and Pedrick Cups as Saltash first and second teams head back across the Tamar. Ashes' second-string overawed Argaum Wanderers with a 45-5 scoreline which included a hat-trick for centre Matt Simmonds. A minute's silence was held in memory of the people who lost their lives in the 9/11 attacks earlier in the week. 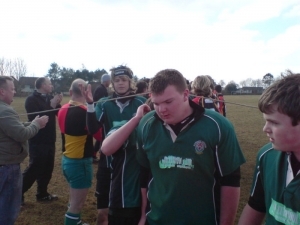 By friday night before this game Argaum had had 7 front row players and 3 scrum half's pull out, and so with a bit of juggling and a guest appearance from OPOs Kevin Bettison at tight-head prop Argaum managed to field what still looked like a fairly strong side.